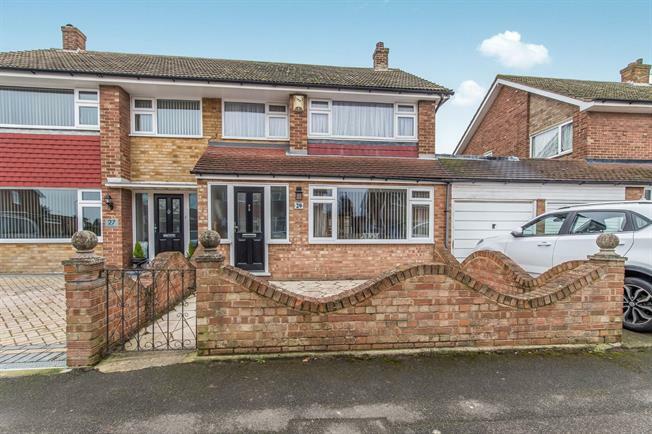 3 Bedroom Semi Detached House For Sale in Gravesend for Guide Price £350,000. This was the second property we've sold through Mann and although they were eight years apart, we've walked away with the same positive view. Beautifully presented throughout and positioned in one of Gravesend's most sought after locations is this 3 bedroom extended family home. The accommodation comprises entrance porch, hall, lounge, dining room, family room with integral access to the garage, kitchen and access onto the rear garden. To the first floor there are 3 bedrooms and a family bathroom with access to a loft room. There is a well appointed garden and a drive. Call now to view. Mann Countrywide is a trading name of Countrywide Estate Agents. Registered Office: Greenwood House, 1st Floor, 91-99 New London Road, Chelmsford, Essex, CM2 0PP. Registered in England Number 00789476. Mann Countrywide is a trading name of Countrywide Residential Lettings Limited, Registered Office: Greenwood House, 1st Floor, 91-99 New London Road, Chelmsford, Essex, CM2 0PP. Registered in England Number 02995024 which is an agent and subsidiary of Countrywide Estate Agents, Registered Office: Greenwood House, 1st Floor, 91-99 New London Road, Chelmsford, Essex, CM2 0PP. Registered in England Number 00789476. Countrywide Residential Lettings Limited is regulated by RICS. Countrywide Estate Agents is an appointed representative of Countrywide Principal Services Limited which is authorised and regulated by the Financial Conduct Authority.